E ver since I can remember, my mother has been straight-up obsessed with chasing solar eclipses. Her fascination propelled my family on trips to Mexico in 1991 and France in 1999 to witness these celestial events, and she’s already gearing up for a 2019 eclipse in Argentina. Like me, she hasn’t seen a total solar eclipse since our trip to France. Naturally, she’s absolutely stoked for the one today, August 21. Upwards of a million people have traveled to Oregon to watch this unmissable eclipse in the path of totality, and she’s among them. This eclipse, she says, already feels different. 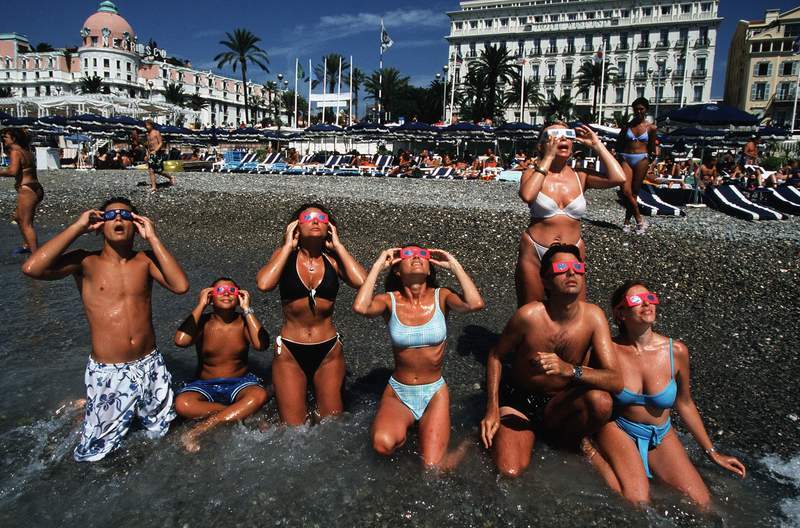 I didn’t understand how unusual my childhood vacations were until the last month or so, when the whole country came down with eclipse fever. When planning trips around eclipses was established as a normal, semi-regular occurrence, I didn’t realize we were any different from a family who took pilgrimages to Disney or to some beach timeshare. Growing up with a unique familiarity with such a majestic event can warp your sense of appreciation. Back in 2012, an eclipse passed through LA, producing a “ring of fire” effect. I made an event of it, hiking up into the famous Griffith Park with a couple friends, a case of beer, and a pack of special eclipse glasses. As we set up our own personal Eclipse Party on the edge of a busy hiking path, I was amazed by the response we got from passersby. By and large, they had no idea what was happening. Granted, unless you’re looking straight at the sky, a partial eclipse at 6:30pm doesn’t look much different than a big cloud passing by. So I can’t blame the dozens of people we encountered for not noticing. But at the time, I genuinely didn’t know that most people don’t have these events marked on their calendar. Apparently not everyone’s mom ships them packs of special glasses weeks in advance. But for the first time, the entire country is just as wildly excited and willing to travel for a solar eclipse as my mother has always been. It made me realize I’d never actually asked her where her obsession comes from. "It's like the world's ending," my mom told me. "And you just have to have faith the sun's going to come out the other side." When I finally ask, after all these years of knowing how deeply she loves these events but not knowing why, there’s some hesitation. First, she admits that though it may sound silly, and despite having no other interest in astrological assignations, she’s perhaps reluctantly accepted the solar power of her Leo sign. But the real draw -- if she had to put it into words, which definitely isn’t easy for something so obscure -- is in the mystery. For her, as I assume for so many others, the draw is “the danger of it.” My mother is a pragmatic person, but even she admits that eclipses are, at their essence, freakin’ spooky. It’s powerful to imagine what people must have thought of this occurrence centuries or millennia ago. To stand there and watch the sky go dark, to see the stars come out in the middle of the afternoon, is absolutely overwhelming. “It’s like the world’s ending,” my mom told me. “And you just have to have faith the sun’s going to come out the other side.” It’s that blend of fear and faith that keeps her coming back. A total eclipse is much more than just a visual darkness. You can read plenty of firsthand accounts that describe near-paranormal feelings: a general body and skin tingling, or even a sense of communing with the universe. Totality is a powerful sight. The difference between seeing 98% of an eclipse and being in its direct path is everything. I had to check with my mother to make sure I wasn’t inventing a memory of watching my first eclipse from a swimming pool in Mazatlán, Mexico. She sent me a picture of my father and brother taking a break from sunbathing as proof that I did not. Now imagine a busy family-friendly, kid-filled hotel pool, completely hushed for the minute or two of totality. The communal experience of seeing a total eclipse in public, especially in that sort of crowded space, can be overwhelming. My second eclipse forwent that crowd experience when we managed a house exchange in the French countryside with a family that lived in the eclipse’s path. 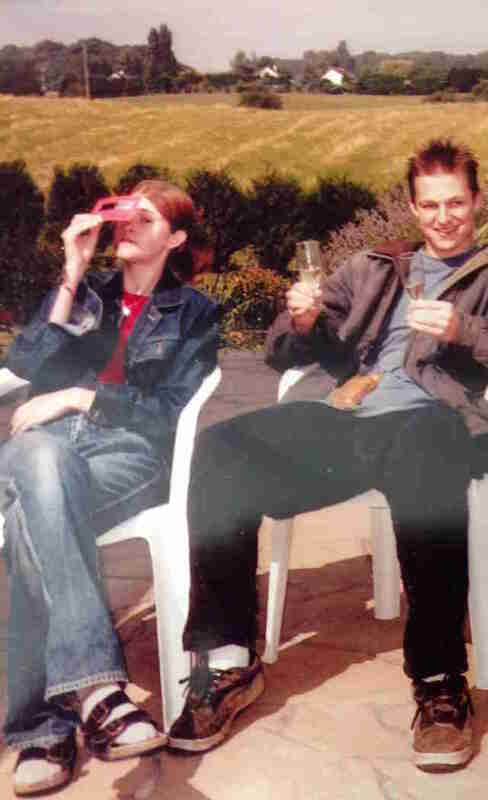 My family gathered in front of our remote borrowed estate, with Champagne that my teenage self was happy to be able to drink freely. During the totality, my humming kid brain went quiet. The memory of the eerie clarity in those few minutes is still clear, decades later. My mother admits to being “a little terrified” for the scene at this eclipse. Witnessing totality is an eerie, almost paranormal feeling. The hordes of fellow travelers who made the pilgrimage to the line of totality will be seeing and feeling and hearing the same thing, all together. For a moment, thousands of people will be staring at a hole in the sky, pondering a sensation of the world coming to an end. My mother is prepared with her own disaster provisions -- snacks, gas, sundries. She’s also packing a tongue-in-cheek resentment that her longtime obsession doesn’t come with some sort of seniority over all these new sun-tourists. Part of me is glad I chose not to subject myself to that crowded madness. Seeing a total solar eclipse is a once-in-a-lifetime experience that I’m supremely lucky to have done twice. But I have to admit it’s bittersweet. The whole country has come around to my family’s passion, and for once, I’m resigned to watching the excitement from the outside. Vivian Kane wants you to please, please remember your eclipse glasses. She just got hers in the mail, and yes, they were sent to her by her mother. You can find her on Twitter at @viv_kane and every day on themarysue.com.